In order to eradicate polio there must be a vaccine in use that is affordable, stable for delivery to undeveloped regions, safe for infants, and not result in the circulation of virus that can revert to a disease causing phenotype (see The Problem with Polio). One method creating this vaccine that could theoretically work is the introduction of recombinant polio capsid proteins being expressed in food items such as bananas instead of in a traditional vaccine1. For example, it may be possible to engineer bananas that express recombinant polio capsid proteins in such a way that antigenic epitopes of the three serotypes of polio are expressed and illicit an immune response at the gut mucosal level when ingested. These recombinant proteins could be engineered so that they are expressed at conserved levels in the banana and are heat-stable. This would facilitate the transport of the bananas, or even food products made with the antigenic bananas, to rural areas in hot climates where the virus is still endemic. 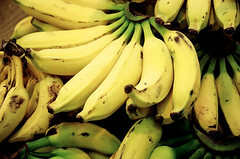 Immunity could be built up in the individual by repeated ingestion of the engineered bananas, and subtyped bananas (serotype 1 antigen expressing, bivalent 1 and 2, etc) could be made for specific regions with only certain strains of the virus circulating. Another benefit would be that infants can ingest bananas and would be a much easier and safer route of inoculation than injection. This food-based vaccine may also be more well-accepted by communities distrustful of injections being given by unknown aid workers. This is very important because sensitivity and reassurance are very important in not alienating the very people that we are trying to help with vaccine campaigns. This approach using modified bananas would also result in a cheap and effective means to generate many doses of the vaccine that could potentially lower the price per dose of polio vaccination. 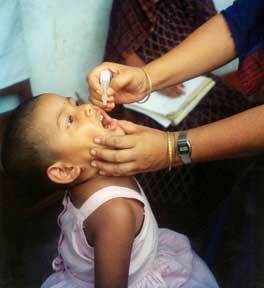 If this banana-based vaccine were developed it would be a great step forward in the fight against polio. Large amounts of bananas could be grown and given to children in areas with circulating polio that would result in significant herd immunity without concomitant circulation of vaccine virus. This would limit persistent shedding of virus and destruction of the only known reservoir for polio. Using this method it would be possible to follow the current WHO protocols for vaccination and National Immunization Days, certification of polio-free regions, and the eventual discontinuation of vaccination three years after WHO certification. However, much work must still be done before these modified foods are a reality and much will have to be done in order to convince the general public of the safety and efficacy of these genetically modified organisms. 1. Goldstein, D.A. & Thomas, J.A. Biopharmaceuticals derived from genetically modified plants. QJM : monthly journal of the Association of Physicians 97, 705-16 (2004).